Berlin has long been hailed as the gay Eldorado of the 1920s, where a large subculture, a progressive sexual science, and a broad movement for homosexual emancipation came together to create previously unknown possibilities for gay lives. This world of possibility was then destroyed by the Nazis. Only following the liberalization of §175 in the late 1960s and the gay liberation movement of the 1970s has anything similar to formerly “gay Berlin” reemerged. This master narrative, however, is too narrow in two respects: it is limited to a distinctly urban conception of Berlin’s public spaces which disregards its domestic and suburban spaces, and it is heavily biased towards cis male gay identity, even where it seems to imply lesbians and trans* people. My paper complicates this story by looking at the years, spaces, and identities it elides. What public localities, such as bars and ballrooms, were available to queer women specifically between the Nazi defeat in 1945 and the building of the Berlin Wall in 1961, and what continuities from the Weimar period can be discerned? What possibilities existed for domestic queer lives in postwar Berlin despite continued criminalization and rampant homophobia? Working from the personal papers of two queer women, I sketch two different efforts to make a queer home, paying particular attention to the intersections of gender and class inscribed in their archival materials. 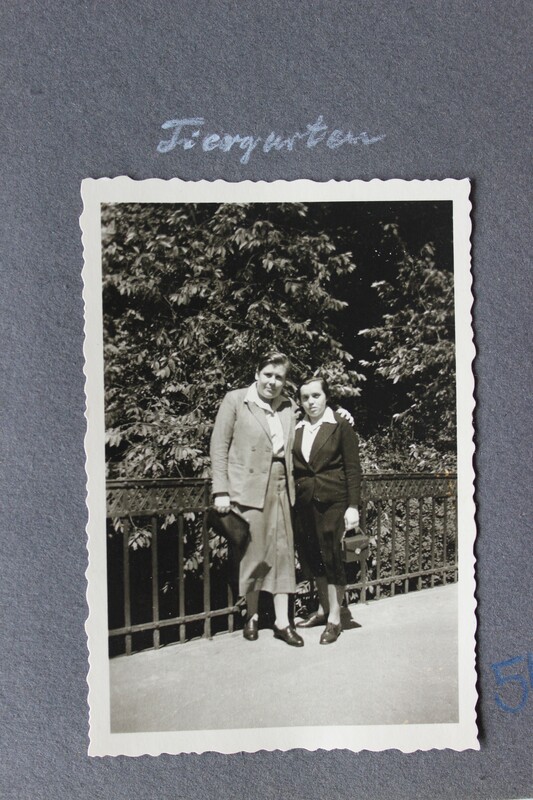 Image: Hilde Radusch and Else “Eddy” Klopsch in Berlin’s Tiergarten park, 1939. Hilde Radusch Collection at FFBIZ Feminist Archives, Berlin, Germany. Andrea Rottmann studies queer history in Berlin, Germany and Ann Arbor, MI, USA. Her dissertation is concerned with the everyday lives, subjectivities, and memory of queer Berliners in the decades after the Second World War.